Birthday presents and gifts for your dad, brother, mother, sister or family or friend on their birthday. A innovative and inexpensive birthday present idea that will impress the birthday guy or girl and impress everyone at the birthday party. Especially good gift for any 30 year old wine lover as a 30th Birthday present. Why not give someone an even greater gift for their 40th Birthday present gift by adding a wooden wine box to the order. Thoughtful and innovative birthday presents for dad from daughter or any other member of the family especially on their 30th Birthday. By the time your son or daughter or even brother or sister reaches 30 they are sure to have developed a taste for wine, so why not get them their own 30th Birthday Presents of personalised, great tasting wine, with their face on it and a message from you wishing them a happy 30th Birthday. This bottle of personalised wine will make a perfect gift for them on their 30th birthday and when you bring the Birthday gift to the party everyone will be very impressed with your 30th birthday present and gift idea. If you are unsure about which 30th birthday present to get and want to hear what previous customers have said have a look at our testimonials page. Our gifts and presents are perfect for your sister or brother on their 30th birthday. Previous customers have also bought their boyfriend or girlfriend a personalised bottle of wine or champagne for their 30th birthday presents. Make sure to add a wooden wine gift box to make the presentation of your 30th Birthday present even more special. 40th Birthday represents a major milestone in anyone's life. What better way to celebrate this birthday than with a truly unique and innovate 40th Birthday present! At Winemax you can personalise a bottle of wine with the 40th birthday persons face and then add your unique birthday wishes by adding a personalised message to the present wishing the man or woman happy 40th birthday. Choose your wine for the 40th birthday present either red or white wine or even champagne for a reason to celebrate the 40th birthday in true style. For the 40th birthday gift you can choose to personalised a bottle of personalised whiskey with a funny photo and a message to make the bottle look like a real bottle that will impress everyone. Add a gift box to make the 40th birthday present even more special. We now also have diversified to give you more choice for 40th birthday presents with personalised gifts such as personalised glasses and golf gifts. 50th Birthday, the big five-o. Usually by 50, everyone has developed a good sense of humour and what better way to make someone laugh is by giving them a bottle of wine with their face on it and a line underneath saying "50 Year Old Vintage". This 50th Birthday gift will really impress the birthday man or woman and will wow everyone else at the birthday party. Your wine gift will be very unique and special and will be personalised with a unique message wishing the 50 year old Birthday person a happy and merry 50th Birthday. You can also write on the personalised bottle of wine "Chateau du John" or "Chateau du Richard" giving the impression that the 50th Birthday gift wine was produced by their very own vineyard! Don't forget to make the gift even more special you can add a gift box and make the presentation second to none. What better way to celebrate his (your dad's) birthday than with a bottle of wine, especially personalised with his own face and your personalised message to your dad. This neat and quirky gift will be sure to bring a smile to his face and brighten up his day with this really impressive and inexpensive birthday gift. A really good birthday present for dad that is a surprising gift when he opens it and see his face on the bottle. He we really appreciate the thoughtfulness and because it's an uncommon gift it will be unique and impress everyone at the birthday party. Really cool birthday presents that are inexpensive birthday gifts. He will be surprised at the label, but when he opens the wine and tastes the quality of the personalised wine, he will really enjoy and love your gift. Unique & funny birthday gifts for him, for her, for brother, for sister, funny 40th Birthday Gift for Husband, for wife, for father, for mother. Funny personalised birthday wine gift makes a great present for a friend or colleagues birthday. Perfect for 18th Birthday, 21st Birthday, 30th Birthday, 40th Birthday, 50th Birthday, 60th Birthday and 70th Birthday. This funny personalised Birthday Wine Gift will light up the party, make a great talking point and impress the Birthday boy or girl and impress all the guests! You can personalise a bottle of red wine, including Merlot, Shiraz and Cabernet Sauvignon or white birthday wine including Chardonnay and Sauvignon Blanc for a brilliant birthday gift idea for her. If you really want to celebrate the special birthday, then why not personalise a bottle of champagne. We have many unique labels for champagne bottle, these are even inexpensive and make great gifts for men. Looking the perfect ideas for special birthdays, then a bottle of personalised wine or champagne from Winemax will make a neat, clever and even cute birthday present and gift. This gift will do two things, it will impress your friend on their birthday as it will have their face or other photo on the personalised bottle and also your unique message for a truly innovative gift. Also, the gift will impress everyone at the party and everyone will be asking where you got such a neat and thoughtful and surprising gift/present from. This present makes a perfect gift for your friend, especially if they are a lover of quality wine. Write your message of friendship on the label and add a photo of your mate, for a awesome and surprising present they will remember forever! Send a perfect gift to Ireland. Are you based abroad? Need to send a really thoughtful gift and surprising gift to your friend or relative in Ireland on their birthday? With Winemax and personalised wine you can do that. If you have an image of them on Facebook or other social networking site, you can use one of their images and upload it to the bottle. Then you can write your unique message on the label and we can send your gift directly to your friend in Ireland. Inexpensive gifts are becoming more and more popular, and there are many inexpensive gifts on the market, but With Winemax, you are able to create a inexpensive personalised gift of wine. And this inexpensive gift can be personalised for anyone, and sent from anywhere in the world to Ireland. Present for 18th Birthday Party? Turning 18 means they can now drink in Ireland and the UK so get them a gift of alcohol they will not just drink straight away and forget about. An excellent bottle of personalised wine, champagne or even whiskey will make an excellent 18th birthday present they will never forget. The unique 18th birthday present idea, will be a funny gift and make them and all your friends laugh. By putting the gift in a gift box, they will be able to keep the unique 18th birthday present for years to come. This also makes the ultimate 18th birthday gift for your boyfriend or your girlfriend on their 18th birthday. Gift ideas can be hard to think of especially a gift idea that is unique and special. At Winemax.ie we have a wide range of gifts ideas that you can personalise and make unique with a photo. This really makes the gift idea extra special and that you put a lot of thought and effort into the gift idea. 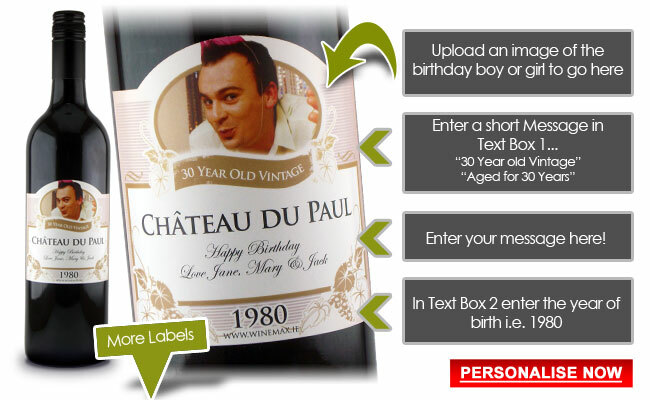 Just select one of our unique labels such as this one for a 30th Birthday gift idea and personalise with a photo of the birthday boy or girl and a unique message on the bottle.